What is full lace wig?Full lace wig means all the hairs are hand tied to lace, which enables you to part the hair anywhere. QUALITY: REMY VIRGIN HAIRLACE: SWISSDENSITY: 150TEXTURE: STRAIGHTCOLOR: NATURAL AVAILABLE LENGTHS"10, 14, 18 & 22 INCHDetails:Are you looking for a high quality wig with a natural appearance? 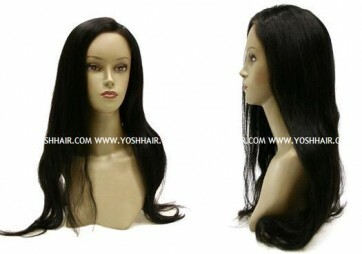 Try lace wigs are specially designed for those with moderate to severe hair loss, but can be worn by anyone who wants the quality lace affords. This lace creates the illusion that the hair really grows from the scalp. It is made of a fine poly silk mesh base in which fibers are hand tied to this thin breathable fabric. It is placed at either the hairline or from the front to the crown, which can be parted in any direction for maximum styling versatility. They are light weight and softer to the touch than regular wigs.Natural hairline, lace wigs are the latest trends for people suffering from hair loss or looking for a cosmetic change. Lace wigs are wigs made with Remy human hair tied to a lace base. Lace is the most undetectable material and it has many colors to suit to your skin tone. When it is adhered to your skin, it gives an invisible hairline, as though the hair is growing out of your scalp. With lace arounding the entire head, the hair can be parted anywhere, also you can wear in high ponytailsVirgin hair is niet chemisch behandeld is. Het is niet gekleurd of gepermanent. Waardoor het nog genoeg schubben heeft om lekker zacht aan te blijven voelen en u heeft minder last van droog haar. Het is net als met uw eigen haar, zodra het een chemische behandeling onder gaat wordt het er niet gezonder door en heeft het extra verzorging nodig.Lace kleur: TransparantVerkrijgbaar in DE NATUURLIJKE TINTVerkrijgbaar van 10 inch t/m 22 inch, 25cm t/m 55cm lang.